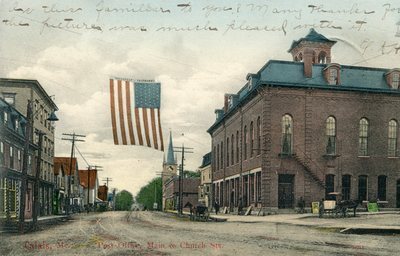 "Calais, Maine, Post Office On Main and Church Streets "
An image scanned from a color postcard depicting the post office at Main and Church Street in Calais, Maine. Undated. Stitched above the flag is the motto "Roosevelt - Fairbanks," suggesting this postcard's scene is based on a photograph taken during the election of 1904.